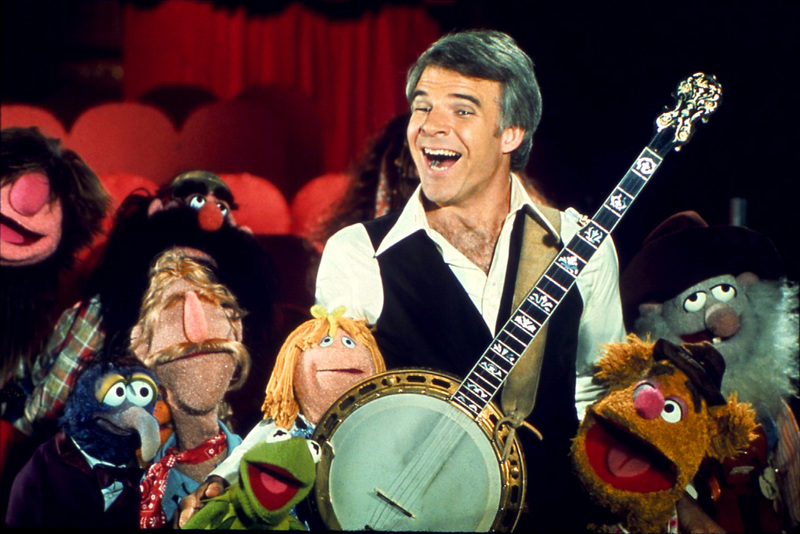 Like After Midnight, I imagine a rotating cast of guest stars in a Muppet Broadway musical. Limited engagements would give stars more flexibility, and popular guest stars could extend their run in the show if they wanted. The biggest question is how integrated the guest stars should be into the plot of the show if they will only be around for limited runs. My proposition is to integrate two or three guest stars into the story directly and leave small segments open in the show-within-a-show for other cameos. Kermit is far too busy directing the show to play lead, so Norm Lewis is the leading man in the show-within-a-show opposite Miss Piggy. Always the professional, he knows his part, hits his marks, and can even calm down Miss Piggy when she throws a fit. Unfortunately, he has a weak spot for the show’s beautiful new stage manager, played by Audra McDonald, and whenever Kermit lets her run through the show, he gets tongue-tied and forgets his part. Nathan Lane and Fozzie Bear are the dual comic relief characters in the show-within-the-show, but backstage, they are constantly trying to one-up each other and be the show’s biggest ham. Their rivalry heats up with increasingly terrible puns and slapstick gags, but when their antics threaten to ruin the show, they work together and bring down the house with a big comedy number. After Sam the Eagle quits over creative differences, Audra McDonald is brought in as the show’s new stage manager a day before opening night. She has a lot of catching up to do as Sam the Eagle’s notes were mostly doodles of the American flag, and Norm Lewis’ constant flubs aren’t helping matters. She also has a secret about the last time she was backstage at a Broadway show, and there is a reason why she has stayed away from the stage for so long. Her first and only time in a Broadway show, she got stage fright and ran away, leaving her cast (which included a young Kermit the Frog) in the lurch. Backstage, she confesses her secret to Norm Lewis to relieve his nerves, and he suggests that she take a solo number in the second act. She is adamantly against the idea until Miss Piggy disappears with Harvey Fierstein at intermission, and they need someone to entertain the audience until they can track her down. Bernadette Peters and Steve Martin will play Muppet roadies. Their Studebaker is painted to look like Fozzie’s car from The Muppet Movie, and it is plastered inside and out with Muppet memorabilia. All they want is a chance to audition for the Muppets. Kermit is so taken aback by their dedication that he gives them a shot. (“Wait, you saw Muppets from Space? Really?”) Steve Martin plays the banjo and ukulele, and he provides lovely harmony to Bernadette Peter’s voice. They get a spot in the show near the end of intermission, just before Audra McDonald’s big number at the beginning of act two. These are my dream guest stars for a Muppet stage show, but I want to hear from the readers! Leave a comment below with your favorite guest stars from the Muppet movies or The Muppet Show, and tell us who you would like to see joining the Muppets on stage! If you like the blog, please share it on Facebook and Twitter, and follow us on Twitter @LudusNYC! We post Broadway ticket lottery times daily, and you can find links to all our blogs, news, and show information! ← Welcome to Ludus NYC!